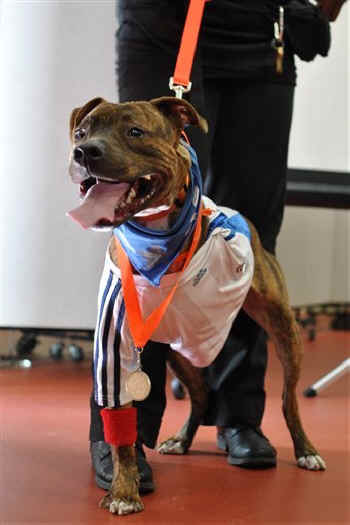 A three-legged pitbull mix that played in a game of doggie baseball has won "Best in Show" at a talent competition held by one of New York City's largest animal shelters. Nine dogs competed in Friday's contest at the American Society for the Prevention of Cruelty to Animals. But it was Prince who impressed the judging panel the most with his feat of catching three baseballs. The nearly 2-year-old dog lost one of his legs and had a pin inserted in another after being struck by a car. The ASPCA's senior vice president of the adoption center says Prince's disability doesn't hold him back. Gail Buchwald says he "struts his stuff like a winner."